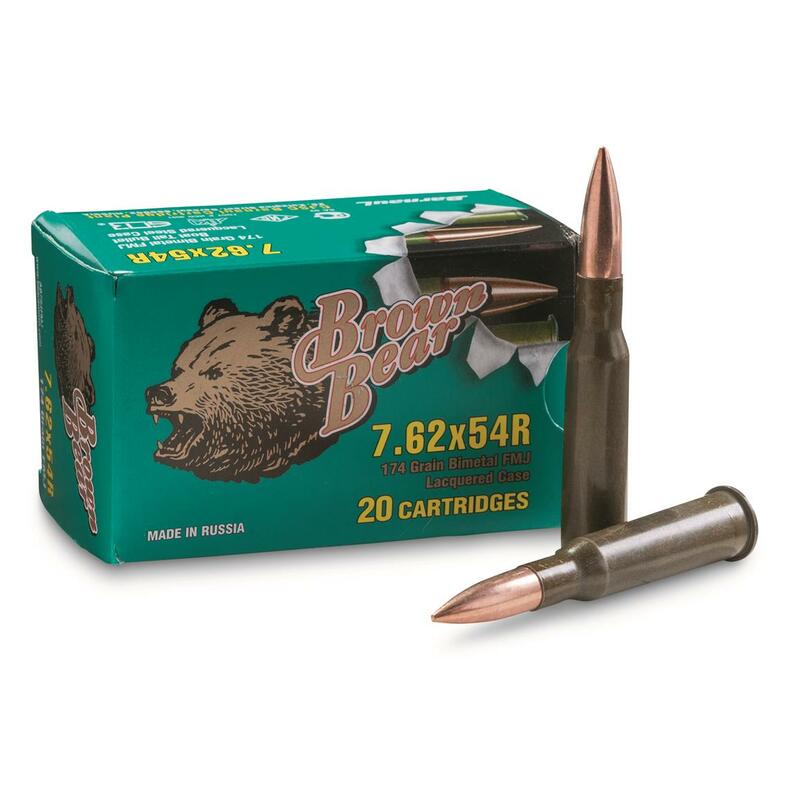 Silver Bear® 7.62x54R 174 Grain FMJ Ammo. This high-quality Ammo features distinctive zinc plating on the cartridge case... hence the name. Silver Bear® offers high quality at reasonable prices. Other manufacturers reserve the silver cases for law enforcement, safari and specialty ammo. This product uses Berdan priming for long shelf life and sure-fire ignition. Silver Bear is loaded to exacting standards. Steel-cased, non-reloadable, non-corrosive, current-production full metal jacket bullets. Muzzle Velocity: 2,495 F.P.S. Muzzle Energy: 2,556 ft.-lbs. Silver Bear, 7.62x54R, FMJ, 174 Grain, 500 Rounds is rated 4.8 out of 5 by 4. Rated 5 out of 5 by SteveD from Great Plinking Ammo Silver Bear is my favorite Warsaw Pact metric ammo and the 7.62X54R functions perfectly in my M44 and the other 91 Moisin clones that I shoot. I like the zinc case plating over the other stuff but that's purely cosmetic and have never had any problem with copper washed or lacquered. Rated 5 out of 5 by Old Gunsmith from Best bang for your buck This ammunition is 100% sure fire, non-corrosive and accurate. I used this ammo to zero my Mosin-Nagant 91/30 then fine tuned with corresponding soft point. It worked like a charm. I was surprised at how consistent this ammunition was and it burned VERY clean. I will buy more. Rated 5 out of 5 by WILLIAM from This is extremely clean ammo.I had an excellent experience shooting these rounds with my Mosin-Nagant M91/30 Rifle. Limited supply of top-quality Ammo.